It's time to revive an idea from 2006 worth reviving: the Pittsburgh Sports Power Rankings. The original installment was 30 deep, spanning everyone from Dan Rooney to Stan Savran. But this time around, I'm going to keep it to a more-manageable 10. So who's generating the most buzz in the Burgh at the moment? 1. Ben Roethlisberger - At a time when the Penguins and Panthers are both looking at the postseason, leave it to a Steeler to steal the top spot. Large Ben has 102 million reasons to rank as the top dog in the city these days. That's pretty long cash for a guy who wasn't even voted as MVP by his teammates. 2. Sidney Crosby - He suffers a severe injury that could've crippled his team. He returns to a squad that's added Marian Hossa, Pascal Dupuis, and Hal Gill, all while battling for the top seed in the East. Like usual, it's good to be Sidney Crosby. 3. Terrelle Pryor - He's controversial, he's talented, and he's got the entire nation buzzing, whether it be for a post-game scrap, an action figure, or the latest on which college he may or may not attend. One thing's for sure: for a teenager, he certainly seems to have a lot of enemies. Don't take it out of the box! 4. 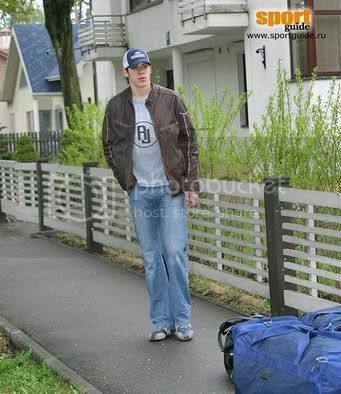 Evgeni Malkin - With Crosby injured, Malkin finally got his turn in the spotlight, and deliver he did. He currently sits just three points behind countryman, rival, and former bunky Alexander Ovechkin for the NHL scoring title. But the question that's on everyone's minds (and that Pierre McGuire keeps reminding us of): did Geno's agent really get roughed up by Ovie? 5. Ray Shero - The architect of the Pittsburgh Penguins as you see them today, it's his neck on the line for the high-roller deadline deals. He could be remembered as the second coming of Craig Patrick...or the second coming of the other Craig Patrick. 6. Sam Young - The high-flying Pitt Panther scored first-team Big East honors, just one day after his team closed their regular season out with a victorious 98-point performance against DePaul. If all goes well, he could be the next Panther in the NBA draft, joining such luminaries as Chris Taft and Vonteego Cummings. 7. Marc-Andre Fleury - MAF, who also nursed a lengthy injury, came back to find his goaltending job taken away by journeyman Ty Conklin, who merely led the NHL in save percentage during that time. Fortunately for The Flower, Penguins management realized where their bread will be buttered for the years to come and re-installed Fleury as the 'tender for the forseeable future. Never before has one athlete's confidence been discussed so much by Pittsburgh followers. 8. Jamie Dixon - The coach of the Pitt Panthers once again leads his team into the Big East and NCAA tournaments, and with that comes mixed expectations. Fans have become accustomed to Pitt teams advancing to the Sweet Sixteen, but this year's rash of injuries and a roller-coaster regular season seems to have lowered the ceiling considerably. Which means you can probably bet on a spot in the Big East Championship Game and a run to the Elite Eight, just to keep us off-balance. 3.When will he be back? 2.What can he do when teamed with Crosby? 1.Who's that girl with him? 10. Mewelde Moore - Randy Moss. Asante Samuel. Alan Faneca. These were all free agents that the Steelers decided not to pursue. But Moore actually got some of the scarce available Steeler dollars by inking a multi-year contract with the team. With the contract comes high expectations, such as the responsibilities as the primary kick returner and the burden of being the first big-time athlete in the city named "Mewelde". Also receiving votes: James Harrison (for the wrong reasons), Ian Snell, Michel Therrien, and the Robert Morris basketball team. Where are all the Pirates? You know like...hmmmm...isn't Jason Bay still a Pirate? Sure, Jason Bay is a kind of Pirate. If only this was done a little earleir. Pretty sure Kevin Pittsnogle would have been #1 during his prime with the Xplosion. Where's the Pirates new manager?! You know, that guy... ummm what's his name again? can't believe you even mention Mewelde.